Powdery mildew | Infonet Biovision Home. Phyllactina spp. / Leveillula spp. / Erysiphe spp. / Uncinula spp. / Blumeria spp. / Golovinomyces spp. / Podosphaera spp. / Sphaerotheca spp. Infected leaves curl and become distorted. Diseased flowers fail to open and drop from the panicle without fruit forming. Mildew causes skin cracking on fruits that have started to form. The diseased fruit drops. Infected seedlings will eventually die. 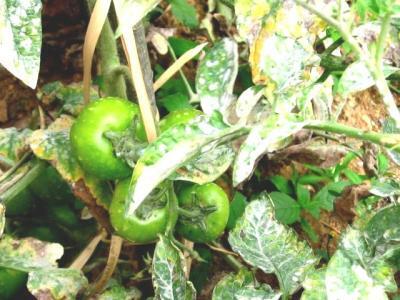 Mature leaves and fruit are not susceptible to mildew. Individual species of powdery mildew fungi typically have a very narrow host range. Hosts include cereals, grasses, vegetables, ornamentals, weeds, shrubs, fruit trees, and forest trees. Notable exceptions include maize, celery and carrots. 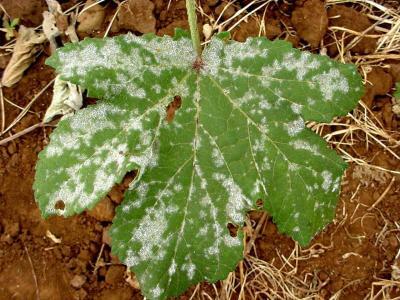 Even though there are several types of powdery mildew fungi, they all produce similar symptoms on plant parts. Powdery mildews are characterised by spots or patches of white to greyish, talcum-powder-like growth. Tiny, pinhead-sized, spherical fruiting structures that are first white, later yellow-brown and finally black may be present singly or in a group. These are the cleistothecia or over-seasoning bodies of the fungus. 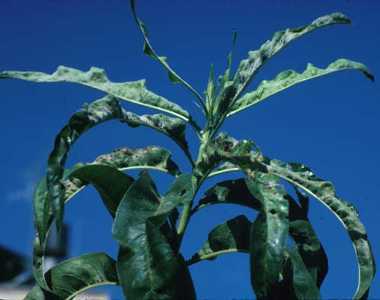 The disease is most commonly observed on the upper sides of the leaves. It also affects the lower sides of leaves, young stems, buds, flowers and young fruit. Infected leaves may become distorted, turn yellow with small patches of green, and fall prematurely. 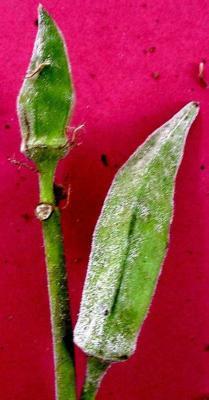 Infected buds may fail to open. Seeding, vegetative, and reproductive stages. Leaves, petioles, stems, and sometimes fruits. The white powdery growth consists of large numbers of fungal spores, which are spread by wind. The disease can spread very rapidly. It is more prevalent in dry weather when humidity is high and nights are cool. 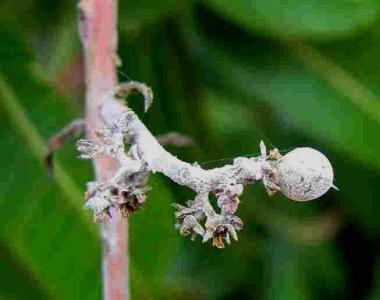 The fungus survives from season to season in dormant buds. The flowering is the most critical stage for infection. Powdery mildews are severe in warm, dry climates. 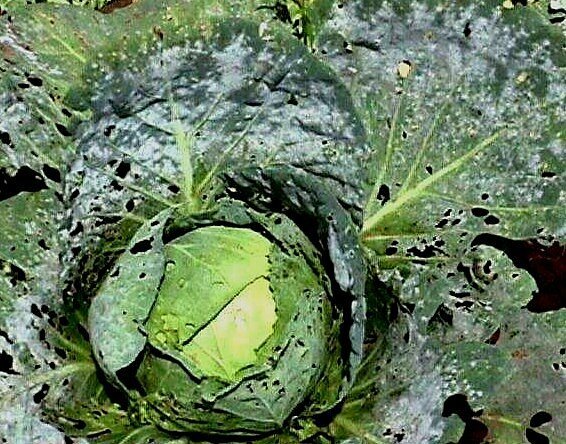 This is because the fungus does not need the presence of water on the leaf surface for infection to occur. However, the relative humidity of the air needs to be high for spore germination. Therefore, the disease is common in crowded plantings where air circulation is poor and in damp, shaded areas. Incidence of infection increases as relative humidity rises to 90%, but it does not occur when leaf surfaces are wet (e.g. in a rain shower). Young, succulent growth usually is more susceptible than older plant tissues. Further below you find concrete preventive and curative methods against Powdery mildew. 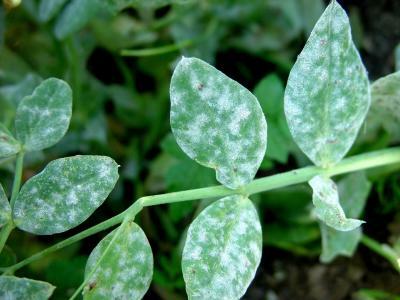 Plant resistant or tolerant varieties to powdery mildew. For example, mango varieties vary in susceptibility to powdery mildew: 'Apple', 'Alphonse', 'Boribo', 'Kent', 'Ngowe' and 'Zill' are highly susceptible; 'Haden' and 'Keitt' are moderately susceptible; and 'Sensation' and 'Tommy Atkins' are resistant. Inquire about resistant varieties before a purchase. If resistant varieties are unavailable, do not plant in low, shady locations. Avoid late-season applications of nitrogen fertilizer to limit the production of succulent tissue, which is more susceptible to infection. Avoid overhead watering to help reduce the relative humidity. Remove and destroy all infected plant parts (leaves, etc.). For infected vegetables and other annuals, remove after harvest as much as possible of the plant and its debris. This decreases the ability of the fungus to survive to next season. Do not compost infected plant debris.Temperatures in the compost often are not hot enough to kill the fungus. Sprays of powdered kelp, potassium bicarbonate or sulphur based products will often control the disease.